The architect Flaviano Capriotti designs a five star hotel that combines innovation and tradition in Italy’s most glamorous mountain destination. 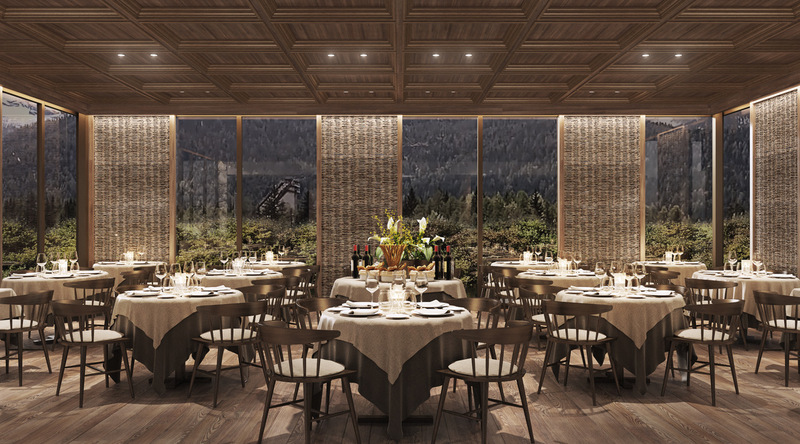 Cortina D’Ampezzo (Italy) – The plan for the new Faloria Mountain Spa Resort, historical glamorous hotel based in Cortina, has finally been unveiled. The project, signed by the architect Flaviano Capriotti, upgrades the resort to the highest hospitality standards, achieving the fifth star and presenting a new hospitality model: at crossroads between local tradition, innovation and comfort. The opening is scheduled for December 2018, just in time for the start of the skiing season and for the Christmas holidays. The project comprises not only the aesthetic and functional refurbishment of the existing building, but also a generous expansion, through the construction of a brand new central body, which recall the typical style of the Dolomites. In this project Flaviano Capriotti has developed an aesthetical language harmonized with the surrounding landscape, revisiting it with a contemporary touch. 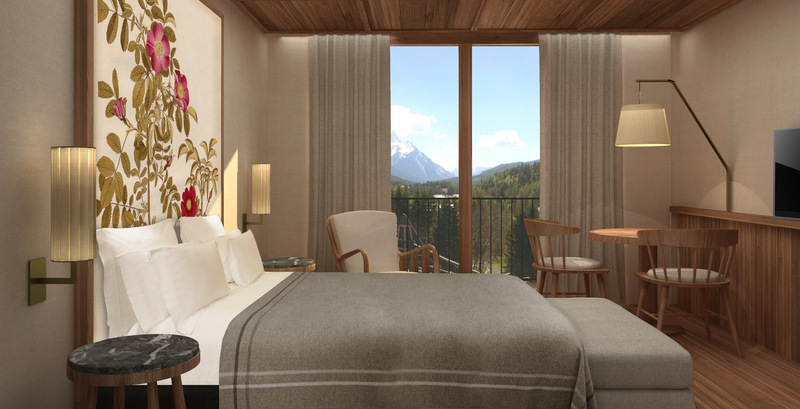 The renovation of the existing hotel aims to the highest international luxury standards to establish itself as the standard of excellence in hospitality for the Alps overall. 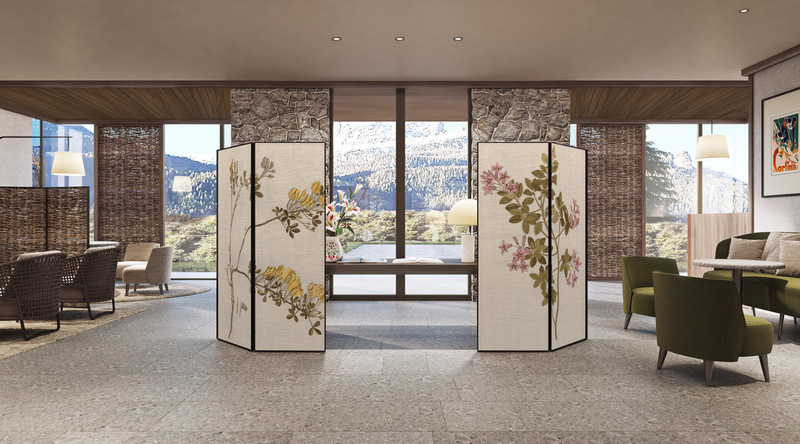 The guest of the new Faloria Mountain Spa Resort is embraced in a perceptive path of the natural identity of the area, relishing a unique environment that offers the most advanced technologies for a functional comfort and unique atmosphere. 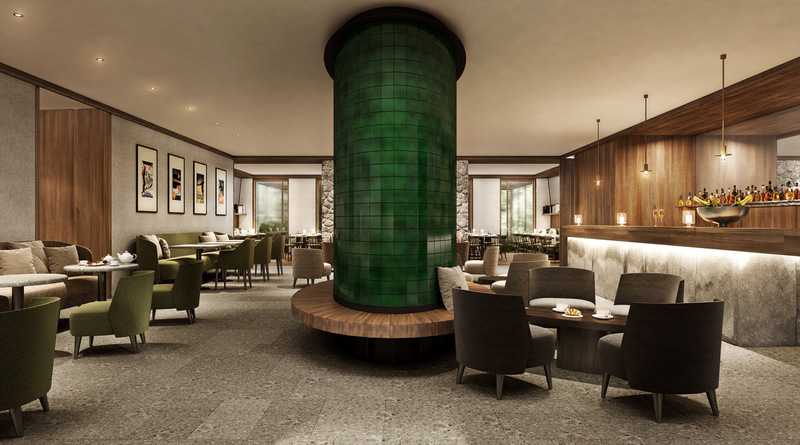 The project includes a new lounge area with Bar and a maiolica tiled stove, inspired to those of the traditional houses in the Dolomites, where the upholstered furniture – which is all custom designed – is covered with warm wool, typical of the mountains. 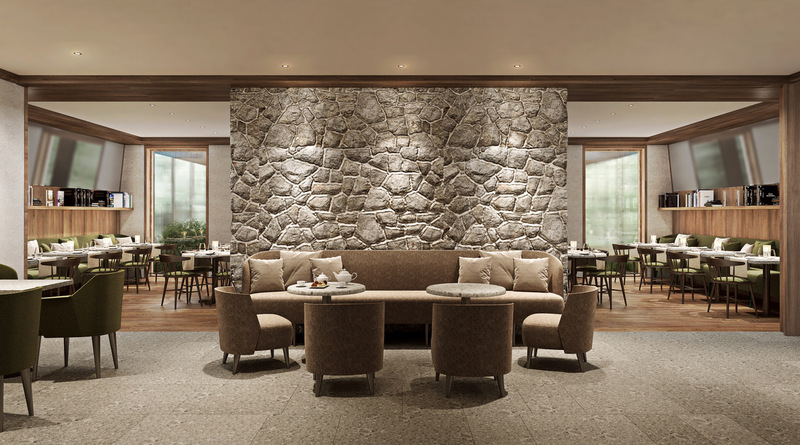 A large “opus incertum” Dolomia stone wall separates the Lounge area from the Bistrot, which is a cozy and quiet space that accommodates up to 40 people, welcoming guests from breakfast to dinner. The chosen materials are Dolomia stone and larch, the padded furniture is made of wool and the chairs are typical, redesigned however with a contemporary accent. The Restaurant, which accommodates 70 people, is the heart of the renewed relationship between building and background, being bounded by a glazed pavilion with scenic views of the mountain Croda da Lago on one side and the iconic 1956 Olympic ski jump on the other. The original vintage larch coffered ceiling is restored. Woven wicker panels screen the light and create an elegant and refined atmosphere. The restaurant is completed by the “Stube”, the center of the traditional house in Ampezzo, built with antique woodwork and a large table that can accommodate 10 guests. The new rooms – split in Classic Room, Suite, Comfort Suite, King Deluxe, Suite King – have all been designed by Flaviano Capriotti, that selected a chromatic palette and materials where brushed larch, wool and Dolomia stone are the common threads to achieve the highest comfort and practicality. wall cladding made of brushed larch and the padded wool bed headboards that are designed with botanical drawings of the local alpine flora. The wardrobes are designed in two parts for a comfortable use in couple, dedicating the central area to the make-up. The cornerstone for the new hotel concept is the redefinition of the SPA and Wellness area, around which a new sensorial and emotional experience was created, devoted to touching every level of perception: visual, tactile, olfactory and emotional. The SPA is designed with a selection of natural materials from the Ampezzo valley: the larch wood from the forest, the Dolomia stone from the mountains and the green from the water of lakes. Covering over 1000 sqm in size, where the guest can experience the sensorial path of the sauna, ice fountain, pool, calidarium and vitality pool. The internal swimming pool is unique for its size and features across the whole Alpine area: beautifully designed and coloured, 25 meter long with three lanes, suitable for every need, even for professional swimmers. 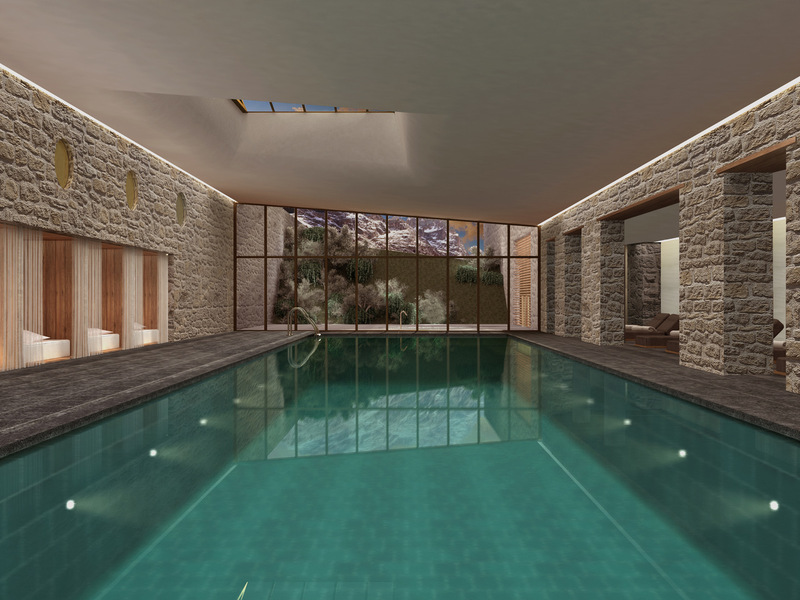 There is a large skylight on the ceiling and a large glazing wall with bronze profiles, from which one can enjoy the view of the Mount Faloria and access the outdoor garden and the outside area of the vitality pool, which being heated can also be used in winter and under the snow. The vitality pool stretches also in the inside of the building, comprising of an area appositely designed for silence and relax.